Tiny desks are scattered across the elementary school classroom at the center of “Gidion’s Knot.” And while scenic designer Katie-Bell Springmann has adorned the room with brightly colored school-project drawings of Zeus and other mythological gods, it’s clear early on that the evening will be more on par with detention than recess. 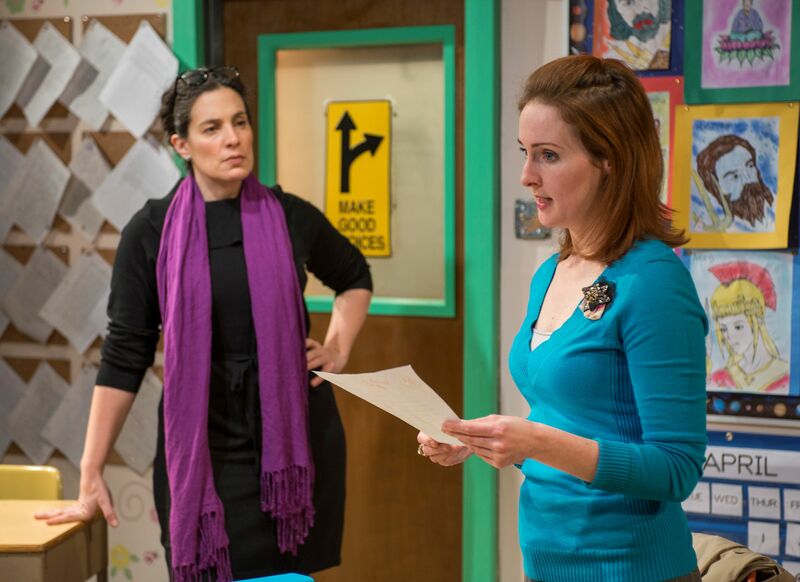 A tense mood sits over the room as fifth grade teacher Heather (Laura Hooper) enters her classroom, pacing frantically and fighting back panic-induced tears. Director Joe Jahraus maintains the eerie mood throughout Profiles Theatre’s production of Johnna Adams’ powerful, if not quite consistent, play. Heather is more than taken by surprise when Corryn (Amy J. Carle) enters her classroom ready to attend their scheduled parent-teacher conference on a Monday afternoon. As we soon learn, Corryn’s son Gidion was suspended the previous Friday and sent home with a note instructing Corryn to come discuss the incident that led to his dismissal. However Heather never expected Corryn to keep the appointment since later that evening Gidion committed suicide, shooting himself in his garage before he could tell his mother what happened that afternoon. The small Alley Stage theater serves as a perfect venue for this intimate production. A sense of claustrophobia continuously builds in the tiny classroom as Heather tries to console Corryn while straining to hold her own poker face in order to not divulge any details before the school principal shows up to oversee the meeting. Before too many specifics are revealed, it’s clear that Gidion may not have been Heather’s favorite student, and Hooper’s eyes bulge with desperation while she tries to maintain professional neutrality. Carle moves around the classroom like an angry ghost, sullen and stricken with grief, but furiously seeking to reassemble the pieces of the hellish puzzle her life has turned into in the last few days. As more specifics about Gidion’s behavior and that of his classmates are revealed, Adams’ play makes observations about how we deal with grief, the way children react to adult situations and how students can be stifled by conventional classroom practices. Unfortunately the story takes a turn for the ridiculous when Corryn, who doesn’t necessarily fit the mold of a conventional young mother, doesn’t seem to comprehend why a fifth-grade public-school teacher would not view the Marquis de Sade as suitable reading material for the class. It’s also difficult to resist an eye roll when it emerges that Heather has had a difficult time discussing the tragedy as she’s about to experience her own heartbreak: her diabetic cat will likely have to be put to sleep once she hears back from the veterinarian’s office. Profiles Theatre at the Alley Stage, 4147 North Broadway, (773)549-1815, Profilestheatre.org, $35. Through March 9.